The Sacred Band is much more than great Heroic Fantasy: it is classic literature, filled with sub-plots, a fine cast of well-drawn characters, insight and wisdom and recurring themes of honor, faith, brotherhood and love. This novel spoke to me on a personal level because it’s a story of pure human drama and powerful emotions. While the characters are larger than life, they are also richly-drawn and written with great depth of insight and humanity. What also rings true with the Sacred Band is their military tradition, their ethos. These characters are soldiers, warriors. They are not only mythic heroes, they are also everyday heroes; real people, everyday people who face extraordinary odds and foes… The Sacred Band has the sharp edge of reality, the harshness, the bitterness and the danger of the real world. Love, loyalty, honor — these are the ideals by which these characters live and die. This novel is epic in scope. It is mythic by heritage. It is positively Homeric. 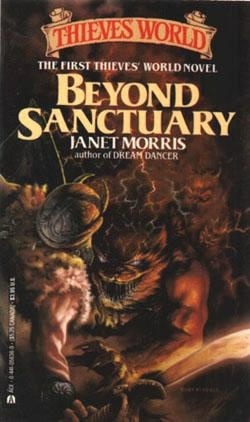 Janet Morris’s Beyond Sanctuary is the first volume in a trilogy that includes Beyond the Veiland Beyond Wizardwall, and the events in this trilogy take place before The Sacred Band, the magnificent novel by Janet and her husband Chris, which I previously reviewed here for Black Gate. 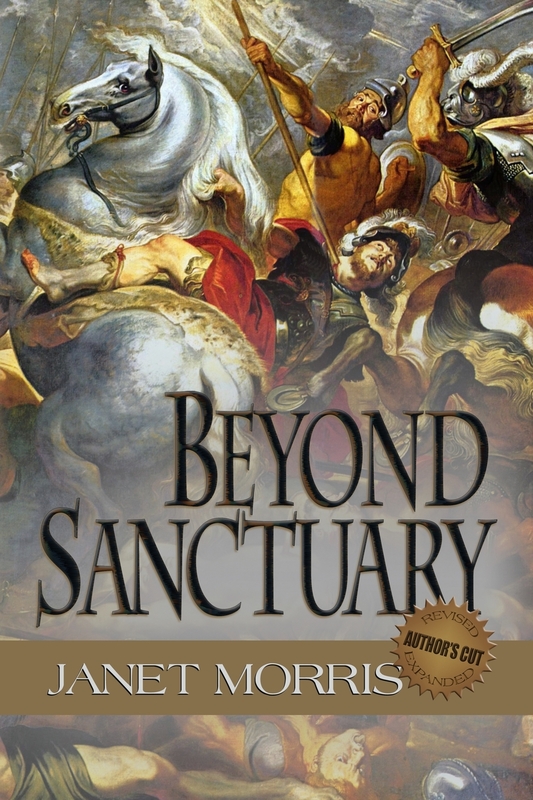 Beyond Sanctuary is a complex novel and truly literary heroic fantasy. It is textured and layered, subtle at times, and yet always powerful. Like the best of all literary fiction, it has emotional depth and human drama, subtext and a philosophy that is expressed through the thoughts, words, and deeds of its characters, and not through narrative lecture and dissertation that slows the pace of narrative thrust. This is a novel driven by eloquent, intelligent characters with real emotions and real problems, with plots and subplots born of the classical tradition… characters that speak to us, that have something to say. And the action never falters or loses momentum. Each chapter picks up more and more steam right up until the explosive finale of the attack on Wizardwall and the resulting aftermath that ends like the final note in a great opera or symphony on the last page. War is brewing and the Rankan Empire hopes to flout Mygdonian expansion into their own lands and flout the mages of Wizardwall as well. And thus, Tempus the Black, also called the Riddler, decides that it’s time to join the fight, leave the sinkhole that is Sanctuary, and go up against the sorcerers and witches of Wizardwall. So he and Nicodemus, who is also called Niko, along with Janni, Critias, Straton, and the other Sacred Band of Stepsons, set out in pursuit of two powerful and ruthless foes: Datan the archmage and the Nisibisi witch Roxane. This is the novel where Tempus first becomes involved with Jihan, daughter of a Froth God, who is in human form for the first time. This is where a young boy named Shamshi, who comes to play a major role later in The Sacred Band, has his mage-blood first awakened by Roxane’s caresses. This is where young Niko, who is heartsick over having lost two battle-partners, loses his maat, his sense of balance and inner peace. And this is where Roxane first spins her web to attract Niko, to play her games with him… and wants to use Tempus to destroy Datan. Ah, but Datan has his own plans to use Tempus — to destroy Roxane! No honor among thieves? There is even less honor among mages and witches. If you are familiar with the classic Thieves World shared-world series, you will encounter many old friends and foes herein: Lastel (aka One-Thumb), Molin Torchholder, Hanse (aka Shadowspawn), Walegrin, Grillo, and so many others. Oh, and you’ll also revisit the Maze and that most infamous den of iniquity, the Vulgar Unicorn. The gods, too, play a huge role in this novel: Askelon of Meridian, regent of the seventh sphere and entelechy of dreams and shadows; Enlil, Storm God of the Armies, who has snubbed Tempus; Stormbringer, the father of Jihan; and Vashanka, the former patron of Tempus, who has been left behind but not forgotten, and whose shadow, like those of all the gods, hangs over the lives of all the characters, for good or for ill, sometimes helping, sometimes interfering. The main plot and the various subplots are complex and to go into more detail would only cause me to give away too many surprises and twists and turns. But I can safely say that you won’t be disappointed in the array of fantastic characters, the intrigue and Machiavellian maneuverings of priests and politicians, and the exciting siege of Wizardwall. Demon dogs, were-snakes, soldiers, demons, and the heroes of the Sacred Band — those warriors “of a higher octave of being” — all clash in mighty battle. Cime the Mage Killer, sister of Tempus, lends a hand. Randal, the allergy-prone enchanter and shape-shifter, so young and so eager to prove his worth, comes into his own and earns the respect of Tempus and the Sacred Band. Niko, too, who is still very young and uncertain, hopes not to disgrace himself in front of his elders and fellow members of the Sacred Band. For me, the theme, the heart of Beyond Sanctuary, is untried youth, of untested boys growing into men, of recruits becoming soldiers, warriors and heroes. It’s a great treat for me to revisit this series, to see the threads and foreshadowing that begin in this first book of the Trilogy and evolve and grow through the next two volumes, and how they all play out, for better or worse, in The Sacred Band. We see the hand of Fate at work here and the influence of the gods. And what I especially like is how Morris involves the gods, how they influence mortals, take on human form, become human and fallible, but never over-shadow the mortal characters or the story itself. Though not always seen, not always taking an active part, the gods are ever there, their presence always felt; this is all superbly choreographed in the classic tradition of Greek mythology. Beyond Sanctuary is a wonderful novel, and this edition is a brand-new, revised and expanded Author’s Cut. This is a lucid, lyrical, and powerful story of love and war, loss and betrayal, life and death. Death is the price we pay for war. Grief is the price we pay for love. Indeed. 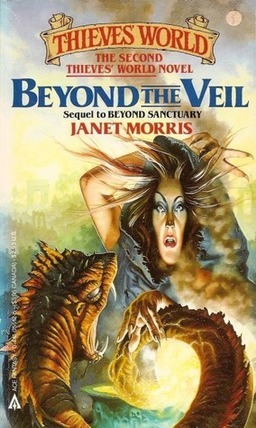 I’ve already started reading the second book in the Trilogy, Beyond the Veil. I urge you to start here, with Beyond Sanctuary, and don’t stop reading. Ever. 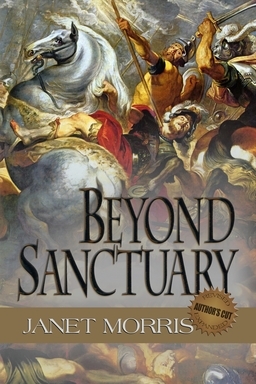 Beyond Sanctuary: Author’s Cut Edition by Janet Morris, Book One in The Beyond Sanctuary Trilogy, was published by Perseid Press on November 12, 2013. It is 398 pages, priced at $24.99 in trade paperback and $4.99 for the digital edition. This entry was posted in Akkadian mythology, ancient warfare, audiobooks, Beyond Sanctuary Trilogy, Books, Coming of age, Coming of age for adults, epic fantasy, equine, Evil, fantasy, folklore, Greek mythology, heroes, heroic fantasy, heroic model, historical fantasy, historical military fantasy, Homeric fantasy, Homeric novel, horses, immortality, literature, Literature, mythic fiction, epic fantasy, Magical Realism, metaphysical/visionary, metaphysics, military fantasy, myth, mythic fiction, Mythic Novel, mythological, Niko, Novel, philosophical fiction, Sacred Band Ethos, Sacred Band of Stepsons, Sacred Band of Thebes, social commentary, sorcery, sword & sorcery, Tempus, Uncategorized, witches and tagged adventure, epic, epic fantasy, fantasy, historical fantasy, history, literature, magic, metaphysical, military, mythology, novel, pansexuality, politics, religion, Sacred Band Ethos, sword & sorcery, war, witches, wizards.